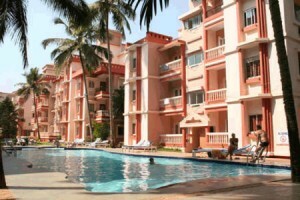 Sharanam Green Resort Goa is a one of its kind resort in Goa. This Resort In Goa is a Pure Vegetarian resort in goa and a delight for vegetarians, looking to stay in an all veggie hotel in Goa. Sharanam Green is 500 meters from the famous Candolim Beach and offers guest ambience and comforts with all modern amenities. Sharanam Green Resort has a total of 35 rooms, of which 31 rooms are Deluxe Rooms and 4 Suite rooms for large families, as the suite room has two separate rooms with independent bath and air conditioning. The 35 air-conditioned rooms at Sharanam Green Resort are comfortable and spacious, complete with modern amenities. Rooms are divided into Deluxe and Suite categories. In-room amenities include: LCD television, telephone, balcony/sit out, mini bar, and an attached bathroom with modern fittings and hot/cold water. Room service is also available. Breakfast between 0700 hrs to 1000 hrs, Lunch between 1230hrs to 1500 hrs and dinner between 1930hrs to 2230hrs. A 24 hour coffee lounge as we know that goa closes soon and you still love to chat. All rooms are air-conditioned rooms. For confirmation of the rooms on definite bases 100% advance is to be paid. The Dabolim Airport is about 30km from Panim. Margao is the main railhead in Goa. Panjim is also well connected by road to the main national highway through Goa, 4A,17 and 17 A. If you have not decided yet or wants to customize tour itinerary or hotels listed above in "3 Star Sharanam Green Resort Package in Goa", then we can change the travel itinerary and make a personalized, tailor-made holiday package, especially for you. We can modify this travel package as per your itinerary, budget, duration and the tourist places you would like to visit, including transportation and airfare should be included or not. Please fill the form below to contact us.